This is a 14 year old female patient. She started on ART in the middle of 2010. She admits poor adherence since the start of treatment with many missed doses. Her mother passed away and she is now being looked after by her aunt. The aunt assumed that the child was taking her medicine, but the child says she was not. The d4T was replaced with ABC due to metabolic side effects on d4T after approximately 6 months on treatment. This patient's CD4 count dropped and remained below 400 cells/ul. The viral load fluctuated but followed an increasing trend. Despite a drop from approximately 10 000 copies/ml in the last quarter of 2010, the viral load was approximately 5000 copies/ml in July 2011. The mutations present in the viral population of this patient include M184V, which confers high-level resistance to 3TC as well as potential low-level resistance to abacavir. Additionally, the NNRTI mutations, K103S and V106M, confer high-level resistance on EFV and NVP. Teenagers can be difficult to manage. This patient has obvious adherence problems and does not have an active caregiver. Since she has been taking her medication intermittently, it is possible that she might have some TAMS that are currently below the level of detection. Since this is probably our last chance to treat her effectively, all effort should be made to ensure adherence before a treatment switch is made. There is no point in trying a new regimen until the adherence and support issues have been sorted out. While these are being addressed, it is an option to put the child on 3TC monotherapy (300mg daily). The CD4 can be repeated after 3 months and 3-6 monthly thereafter. There is no point in doing serial VLs. When the patient CD4 drops below 250 cells/ul, it is imperative to start a new regimen. Once the patient is ready to re-start ART, there are two available options. She can either take AZT, ddI, LPV/r, but she could potentially also take the more tolerable combination of TDF, 3TC and Aluvia. She is old enough to tolerate TDF, although she will need monitoring of her bone mineral density (if feasible), electrolytes and renal function. 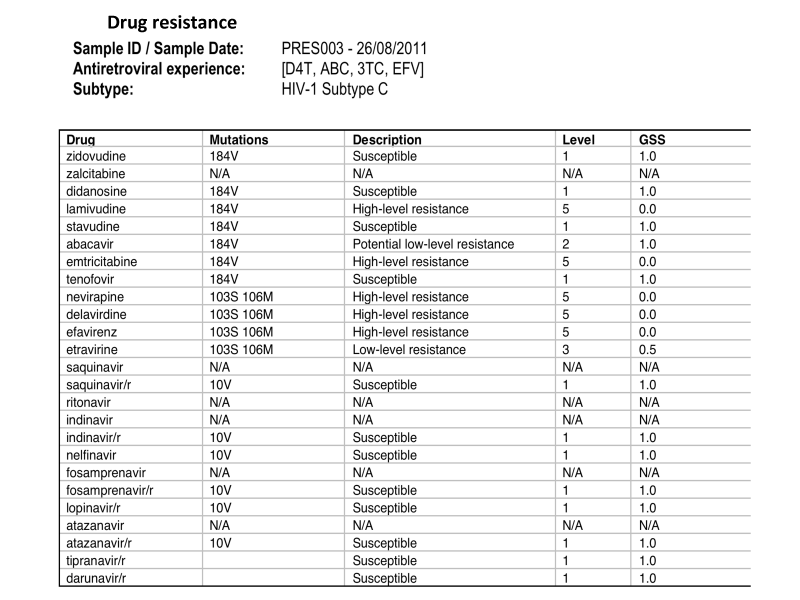 I.What GSS is needed for virological suppression? II. Is there any evidence for a 3TC holding strategy when serious adherence issues are identified? I. Clinical trials have shown that patients on regimens with a GSS = 3 have a significantly higher chance of achieving an undetectable VL. II. There is some evidence for this strategy and it is sometimes advised when there are major adherence issues or when waiting for access to new treatment options, especially in children. One randomized study demonstrated that in patients harboring a 3TC-resistant virus, 3TC monotherapy may lead to a better immunological and clinical outcome than complete therapy interruption. This strategy should however never be undertaken in any patient who ever had a low CD4 and this strategy can only be utilized while the CD4 count remains above at least 250 cells/ul. II. A short-term strategy of 3TC monotherapy could be considered when there are ongoing adherence problems that could compromise the next regimen. Castor D, Vlahov D, Hoover DR et al. The relationship between genotypic sensitivity score and treatment outcomes in late stage HIV disease after supervised HAART. J Med Virol. 2009 Aug;81(8):1323-35. Levin LJ. Changing antiretroviral therapy in children. Southern African Journal of HIV Medicine, Dec 2009:85-90. Castagna A, Danise A, Menzo S, et al. Lamivudine monotherapy in HIV-1-infected patients harbouring a lamivudine-resistant virus: a randomized pilot study (E-184V study). AIDS 2006, 20: 795-803.